WASHINGTON (AP) — States should ban all driver use of cell phones and other portable electronic devices, except in emergencies, the National Transportation Board said Tuesday. The recommendation, unanimously agreed to by the five-member board, applies to both hands-free and hand-held phones and significantly exceeds any existing state laws restricting texting and cellphone use behind the wheel. 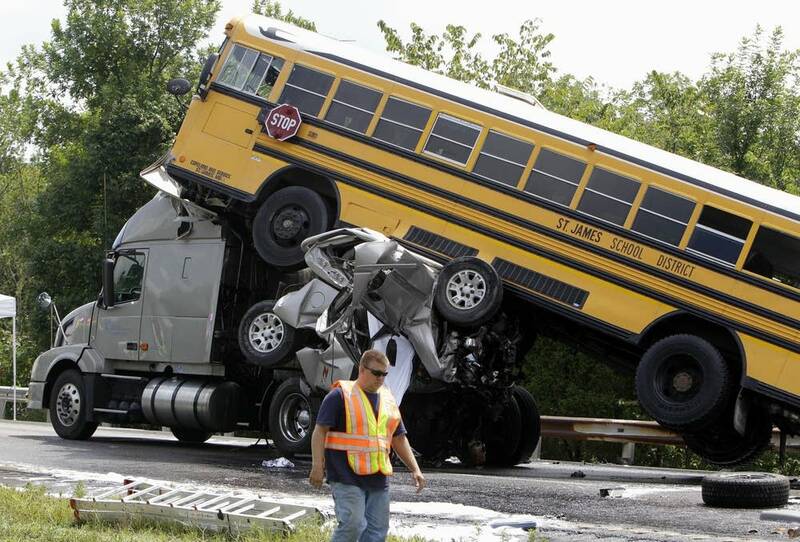 The accident is a "big red flag for all drivers," NTSB chairman Deborah Hersman said at a meeting to determine the cause of the accident and make safety recommendations. It's not possible to know from cell phone records if the driver was typing, reaching for the phone or reading a text at the time of the crash, but it's clear he was manually, cognitively and visually distracted, she said. "Driving was not his only priority," Hersman said. "No call, no text, no update is worth a human life." The board is expected to recommend new restrictions on driver use of electronic devices behind the wheel. While the NTSB doesn't have the power to impose restrictions, it's recommendations carry significant weight with federal regulators and congressional and state lawmakers. In an appearance on MPR's Midday program Tuesday, Gov. Mark Dayton said the measure would improve public safety. But he said he'd have to determine whether the public would accept the ban and it could be enforced. "One of my philosophies about government is that we need to set rules or laws that we can enforce. One of my frustrations with the [carpool] lanes, for example, is that people ignore it with impunity," he said. Minnesota law already bans drivers from texting. It also bans permit holders and people who have had their license for less than a year from talking on a cell phone while driving. Missouri had a law banning drivers under 21 years old from texting while driving at the time of the crash, but wasn't aggressively enforcing the ban, board member Robert Sumwalt said. "Without the enforcement, the laws don't mean a whole lot," he said. Investigators are seeing texting, cell phone calls and other distracting behavior by operators in accidents across all modes of transportation with increasing frequency. It has become routine for investigators to immediately request the preservation of cell phone and texting records when they launch an investigation. In the last few years the board has investigated a commuter rail accident that killed 25 people in California in which the train engineer was texting; a fatal marine accident in Philadelphia in which a tugboat pilot was talking on his cellphone and using a laptop; and a Northwest Airlines flight that flew more than 100 miles past its destination because both pilots were working on their laptops. The board has previously recommended bans on texting and cell phone use by commercial truck and bus drivers and beginning drivers, but it has stopped short of calling for a ban on the use of the devices by adults behind the wheel of passenger cars. About two out of 10 American drivers overall - and half of drivers between 21 and 24 - say they've thumbed messages or emailed from the driver's seat, according to a survey of more than 6,000 drivers by the National Highway Traffic Safety Administration. And what's more, many drivers don't think it's dangerous when they do it - only when others do, the survey found. At any given moment last year on America's streets and highways, nearly 1 in every 100 car drivers was texting, emailing, surfing the Web or otherwise using a handheld electronic device, the safety administration said. And those activities spiked 50 percent over the previous year.